Once again it is time for the quarterly bloggy giveaway from BloggGiveaways.com running from October 27-31. I joined the summer one and had a great time meeting a lot of new people and finding fabulous new blogs to read. This time around I am giving away some items that will be great for the fall/winter months ahead. 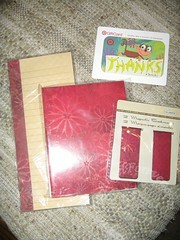 A magnetic note pad with matching note cards and bookmarks, plus a $5.00 Target gift card. 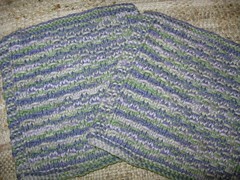 In addition to this, I am going to make the winner their choice of a knitted washcloth or two. 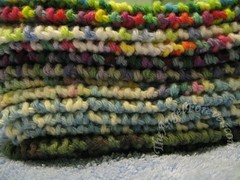 I have lots of patterns that I can use or simply make something like the ones below. The winner will be able to select the color they would like. I will open up this giveaway to anyone. To enter, just answer this in the comment section –> Tell me one thing that you love about the fall (this must be included or your entry will not count). Be sure that I have an e-mail address that I can contact you for mailing address after the giveaway is over. I will use random.org to generate a winner from the comments. This giveaway closes at 10:00 pm EST on Friday, October 31st. – Blog about my giveaway and link back to me. Please leave a link for me to check it our so I can thank you. – Add my blog to your blog roll. – Stumble my post and let me know your Stumble name. – Twitter about the giveaway and let me know your Twitter ID (TheAngelForever is mine). I love the change of colors all around and the cooler weather. It probably doesn’t hurt that my birthday is the 1st day of fall! thanks! My favorite thing about fall is the changes in the colors of the leaves on the trees. Well, that was my favorite thing when I lived in New England. I am in Arizona now, and my other favorite thing about Fall is preparing for the cluster of holidays! Thanks for the chance. I love the weather. We really dont have leaf changes here (FL) but I would love that if we did. I just love the relief from the heat! Love how God’s creation explodes at this time. The cool breezes, the colors, the leaves falling and crunching under your feet. Oh…and pumpkin pie! Love the change of weather, please enter me and thanks! Comments are now closed. Thanks to everyone that entered. I will contact the winner soon and will post here over the weekend.